6 months and there wasn’t much change in my day to day activity but yes with everyday I was loaded with more work in office in turn my cribbing to babaji also increased. My training period will come to an end this week & today I am hell nervous what will happen. I just prayed to babaji to let me keep my nerves cool as with this nervousness things would go wrong. Morning too I took a cup of tea to my prem exactly the way I do it nowadays, he would be busy with his planner and arranging the documents which he would have got home to complete it. I replaced his planner from his hand with the hot cup of tea with a small smile playing on my lips and he took it every so sweetly a sip that’s when I saw a tiny flinch in his expression but then he was back to normal. I enquired him what happened through my eyes but he just nodded for a no and handed back the cup to me & took the planner from my hand made his way to towards the dresser to get ready to the office leaving me confused. I saw him getting ready while he showed the time reminding me that even I am getting late to office. So I make my way out when suddenly the smell hits my nostrils I check again the cup in my hand had coffee and not tea. “Babaji why do you always make me land in mess, then what happened to the Tea I made” I ran back to kitchen to check that thankfully my MIL has not come in to get her coffee. I don’t know by the end of this week what all things will go wrong with me. Even prem is behind me to join him but then what will happen to my dream. I slowly settle my things once I reach my seat, open up the documents which are supposed to be completed when my attention is taken by envelop having my name which is kept on my table. I take it out & read it only to be surprised to see as was my confirmation letter welcoming me into KD officially, that was my second step into creating my space here. I wanted to jump & scream with my excitement but then already my light up face was raising eyes of Minal, my colleague who just came in. “Look at your face it say’s all your story. But you look worried too” Replied Minal proudly on accomplishing of getting her guess right. “Yes, I don’t know what will he say when I will tell him about this.” Geet put front her hesitation. “You want it right then even he has to agree with you. But Geet didn’t you guys discuss this before.” Minal enquired. “Well he didn’t agree first but then his mother made him agree.” She stated the truth. “Then you better tell him & get this sorted out, early you guys discuss this it is good for you.” she advised wisely to Geet. Then she pulled out her bag to get some money “I am planning to distribute sweets today to everyone.” Geet said feeling excited. “But it is already confirmed na Minal.” Geet replied as she felt little disappointed at being stopped. When Geet turned to start her work suddenly she heard her boss’s voice talking in his bluetooth attached to his ears. Everyone were back to there work with all their focus on only thing did boss noticed how sincerely they were working. But one had other plans she had to thank him for giving her this happiness. “He is the reason for this big happiness.” Geet stated the truth & left to speak to Jenny (sec of Boss) to check his schedule, while our Minal was more confused with how was he responsible for Geet’s happiness. “Jenny, how is boss placed today.” Geet enquired. “Geet, don’t ask he is here for just an hour and is struck in extremely tight schedule.” Replied Jenny. “What, Gayi bhaasi pani maine. But why is he here just for an hour.” Geet asked. “Well he was not supposed to be here today as 3 site visits were planned but some designs had to be altered so he is back here and in an hour he will be off to sites.” Answered Jenny. She came back to start her work place but peace was somewhere far away from her & as the time lapsed her restlessness only increased and our Minal was trying hard to keep Geet’s nerves cool when her own mind had confused her a lot. “Geet, cool down talk to your hubby in the evening. Everything will be fine. Too much excitement at these times is not good for your & your baby.” Minal tried to sooth her anxiety. “Geet, then why you were so happy & then you were blushing too. Oh you were happy about your confirmation and I thought… sorry sorry” Minal replied after realising her own assumptions as wrong. “It’s okay Minal, let me catch boss & convey my thanks to him.” Geet replied. Just then Geet saw Maan moving out of his cabin & she ran behind him to express her happiness but he had moved into the lift and was busy with his mobile. She ran a little to get into the lift before it closes and that’s when Maan saw her in the lemon yellow saree which complimented her skin & pulled her as she stumble into him just in time before the door closed behind her. With the sudden pull she looked scared with her eyes closed and hands clutched him in fear. His long fingers shoved the strands which was teasing him as it said see I am close to her than you. “Geet” came out of his mouth which along with the cold metal which touched her back brought out of her fear to meet the dark black eyes of his but again the world stood still for them. This time it was the sound of the lift indicating them to part away before it opens up. “Thank you” was what she could speak out before the door opened & he strides away but not before his long fingers caresses her checks. I flew away from the college far away from the place where I burnt her with my own flames as I was not able stand any more minute at that place; how long do I have to face the same thing again and again. Every time when the sadness has engulfed me I have always consoled my heart that it isn’t my mistake everyone has to go through these pains in their long-lasting life. Heavy as this heart feels now with the overwhelming emotions I stare at the Sun which is all set to take a dip in the vast expanse of ocean but now I have nothing to hold on to there is a deep stillness which has settled in me as the world has moved but I haven’t. No matter what moves or what doesn’t that doesn’t bother me nor did that before or now. I am back to that phase where even my existence wouldn’t substantiate anything. I shouldn’t have involved in helping her; had I not there she would have stopped in another manner or even if failed in her attempts she would have lived, she would have lived is what my mind and heart repeated again and again. There was no count how many times these words I repeated again and similarly there was no count of times the sun had plunged into the waters every time it had only made me things clear of what I am supposed to do now. I sat waiting for the waters to stroke me the roaring waves have not calmed after that day like it knew she wouldn’t return ever again to these shores. Nevertheless I couldn’t have asked for an easy end nor will it be easy to reach that end it can only be an ocean which can consume me without any snag. Slow as snail water tried to get close to me as it has been pulling the sand beneath me with every wave I was getting close to her. But the water which tried to get in contact with me was meant with same tragic end as Geet. I had to wait till the ocean devour me so powerful they are that I am sure within short time I would put off this fire within me. As if an unknown grace I feel the smell of the rain which is all set to drench & also to quench the thirst of the earth and help me to reach her sooner. Every drop of water freshen me of her memory; her way to play with it how she had let go of her camouflage image and had shown what a white angel she is. With her thought itself I can feel the calmness setting in me or was that the droplets from the clouds showered just after the cloudburst I could see the huge ocean roaring again in the bright light of the lightings which illuminated the whole place. There was bliss today as I drenched for the first time, it was not a drizzle which would evaporate before touching me. I stretched my hands to collect the small amount of fall in my palm as they disappeared very soon but the fall was not short of the water it only increased as the time elapsed. With the increase in the pour even ocean seems to be more intended to swallow me within as I hit the first waves of the huge mass. It left me shocked as I could hold to anything, I felt like I am moving without my own will. Today there was only one will that was to try every possible way to put off this blaze. Even the thought has not left my mind I was hit by another way, now it seemed as if I was floating in it and next second I was submerged in it. I want to go deep into it so I tried to find the ground and started to walk into the depth of it. As I stepped deep within my luck just flew away because the water which was soothing my soul just sweept in making a space between me & the water mass. Same like Geet had created when we were in the college, was she here or was it someone else who possessed the same power. “Geet …” my lips took her name as a whisper and just as that day today also rain which had been pouring stopped and my attention went towards the form in the shadows. “Geet…” I called out again. “Yes… Maan…I am back. Back after completing my cycle, water cycle. I had evaporated in air getting converted into the clouds and with the bursting of it; rain had poured so did I along with it.” I heard her voice it soothe my soul more than the water had as now my heart felt light as she is back. And before she came any closer I had to get away from her again. “Geet… I can’t tell you how glad I am to see you but this time I am not going to let you come near me. I am going as far as possible away from you.” I declared my decision before she did some stunts. I tried to move up to flew away but then I saw a wave coming towards me so I turned right but there was another wave which raised there. I knew it was Geet’s work; she wouldn’t let me go without her say on it. “Ok… Geet… I will hear you out. Now stop them.” I let a sigh coming back to my old position. I was surprised with her revelation; was that true can we live a normal life. “Geet… Can we live without any of these restrictions? Can we without terminating each other.” I asked her again. “Yes … Maan we can but are you willing to be with me till the end. Will you love me without any of my ability to control water? Will you love me…. ?” She replied with uncertainty. “Then I will be the happiest person, but how can you love me when I ….” My words were stopped by her finger on my lips. “We both would sort it out just be my side always. Now I want to hug you can we let go of our powers soon.” She replied excited. “Yes.” And with that I took a step back creating a little more space between us as we focused our powers into a ball which came out from our chest leaving them away she let that flow into the depths of the ocean while mine travelled back to the morning sun which was breaking dawn & lighting up the sky and also of my life . With that we were free from the shackles of our power to bind in another shackle of love. We were out of water and Geet was in my arms as she didn’t waste a second to engulf me. I lifted her in my arms without any restrictions as I made way back to her home. 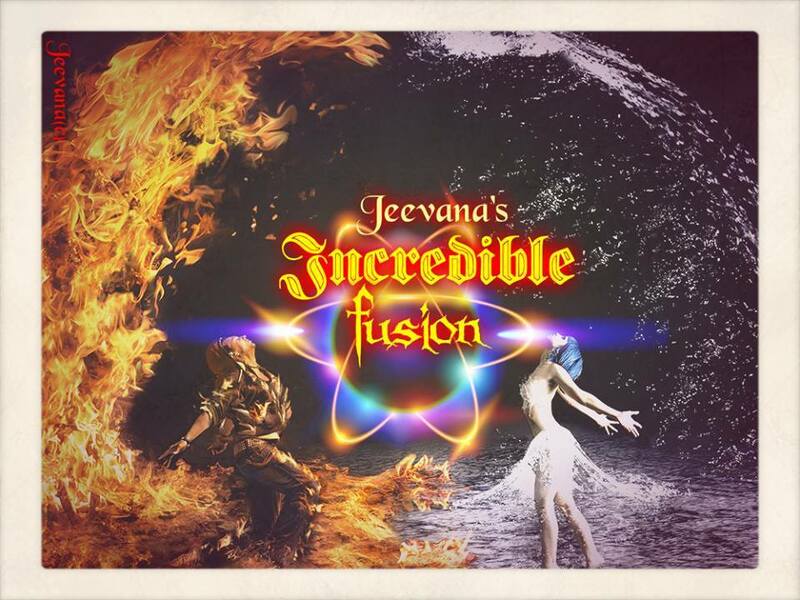 What had seemed as an impossible has turned into incredible fusion; fusion of water & fire. I was trying to come out of it but Samir had held me under his clutches that’s when I heard a faint whisper “Maan…” I heard my name but where is she? I was struggling to come out of this water since Samir had blocked it with his power Air on the surface & chillness was surrounding me affecting my strength but when I thought of escalating the fire force, water caved in; For outside world I was submerged in water but in reality I stood in the middle like a baby in the sack when it is in his mother’s womb. I knew this was the work of Geet, she wouldn’t harm me just like I couldn’t. Within seconds of the thought I could see Geet forming from the water. Although I was still thinking how she can blend in him I felt her in the close vicinity of mine only to witness her approaching me in steady steps compelling me to move as far as possible but she had surrounded me, I had no where to go. “Geet ….” I called out to her making her realise our close proximity however her next words grabbed my attention as I forgot everything. I felt a chill ran over me as she engulfed me in her arms, closing the gap in between the water while her lips did its first sin of kissing me on my cheek which was melting me but I could feel warm with those lips on me. She cupped my other cheek with her hand. My heat burned her it was just the beginning as I could feel her drained of life already. But that didn’t stop her as she hugged me for a little long time and finally whispered “Today, it is time for the moth to burn. Erase me today with this life and from your memory. Good bye Maan.” All I was left was with another pain to see my life slip away from me. I had never felt so apprehensive associated with the fire but today I being the fire only burnt her. I wanted to hold her but my mere existence near her has only killed her. It would have been better to drown in her than seeing her vanish in thin air. But now I cannot make her sacrifice to go in the drain, with that thought I emerged from the bottom of the fountain to turn him into an extinct being. With nothing lose nor to gain I transformed into enormous mass of fire with only purpose of destroying Samir, who induced Geet to take such a step. Fire which left my skin only had one destination that was to mark his death defining burn. As Geet had said she has successfully blended in the air taking control of even air through the water content in moisture which increased in air making my task easier as Samir is not able to deflect my fire & its way to burn all the traces of his skin. Today the fire has effectively destroyed the guards of Water & Air which has blended together leaving me all the strength to govern the world but at what cost I burned my soul with them. Training was not an easy task as all the heads were hell bent on completing their task from me as I was having a little more experience in designing than the other trainee. Seeing these heads eating my head I was actually getting lured by my patidev’s offer of joining him as co-MD but that would only mean I have to lose my dream of creating my niche. Well it is not the mistake of these heads also as they have to report to their MB. First I was surprised learning the new designation as MB then understood it was Main Boss but I felt that more suitable would Mad Boss. I don’t why he loads more work on his juniors even before they complete the work in hand and on top of it he doesn’t give us enough time to understand the requirement. Geet come to boss cabin now… Sasha summoned me. Today I am way to happy to hear that my immediate head Sasha called me in the cabin of our MB, I was excited as well as expecting to get praise for the flawless & unique design which I had designed it on yesterday evening only. But in my anxiety I forgot babaji would not have laid my path without any obstacles. I knocked at the door once before entering into the cabin to witness all my happiness going down in the drain as I actually got to know the reason of the summon. Boss, she is Geet who did the … Sasha stopped right there when she saw Maan, the boss raised his anger filled eyes communicating to stop her. “So you are the one who did this design.” Boss asked in his grave tone which actually made my heart to skip a beat not out of love but fear. “Do you know what you have drawn Geet, do you think it is your dream which you are designing a hawa mahal floating in air without any strings attached to it.” Boss screamed out on me but here I wonder what was the mistake in it? Then boss continued to show me what was wrong in it & asked to get it corrected right now. I slowly collected the papers rolling to take it to my seat to complete it. So I started to settle all the papers on the board while I heard Boss warning Sasha for not repeating the mistake again before she was asked to clarify on some paper work. I guess she had received her due regards from this mad boss before I was summoned. “Babaji what was my mistake if Sasha missed to point out the same when she checked it.” I cribbed to my babaji. But I didn’t know how I missed this basic thing which would have led to a very big loss but luckily it had been the same MB who identified it just before that was sent to the client for approval. I was still thinking on how to start it without much correction when I felt warm as if someone was staring I was about to turn back and look if something is wrong when I sensed a warm hand come from nowhere which actually startled me but Boss was so serious & working on the project drawings. I thought to move a bit to enable him to see things clearly as I would be blocking his view nevertheless I didn’t want to be rude either so I slowly thought to give him space without being noticed, I had just raised my one leg when I felt his another hand taken a eraser from other side, he stood caging me as if I didn’t exist and here I was the bird who was struck in those strong bars though hands in this case. What to say him first he is boss, next he was so involved in his work that he is not able to see anything but his drawings. “Babaji help me.” is all I could say looking up at his direction when I heard my boss shout in my ears. “The board is in front of you not pasted in the roof.” That’s when I look at him who stood atleast a foot away now from me. I wonder was I dreaming, as he went back to his seat. New designs were to be sent to the client & when I, Maan Singh Khurana saw them prepared by the new trainee I was impressed but when I went in studying the structure in detail I found the basic itself was not followed properly. Being a new person such mistakes happen but what are the heads for. Wasn’t it their job to take care of the work done by their juniors? And to top it not even accepting the truth that she has missed reviewing the work. What can I do other than warning a senior & also having a quite a few experience with our KD. But I will make sure both the head & her junior have a tough time in here atleast till they don’t change my opinion on themselves. I gave the due warnings then instructed them about next action. While my attention was on the work it started to waiver on the direction of Geet who stood showing her back there by blocking my view to the drawing board. I was trying to see if she was doing it properly or not however my gaze couldn’t stop from analysing her creamy back which was peeking through the curly hairs and those smooth long arms. My eyes followed the length of her arms and when it reached till elbow my eyes went towards the small waist which was glowing in the light behind the thin fabric of the saree. Thoughts didn’t stop there as my fingers itched to stroke them atleast once. Next second I was standing right behind her to accomplish that wish but just then Geet murmured something under her breath which brought me out of my trance. “What the hell was I doing?” I questioned myself “Why was I thinking all these here? All these marriage things had corrupted my mind.” But I can’t just back off why I stood here, so without any delay I took the pencil which lay at the bottom stand of the board while my fingers slightly gazed the fabric of her saree & started to complete the remaining part before I settled back in my seat in my attitude. It looks so serene to watch that smile on Geet’s face her hair tried every bit of its work to hid the small curve of her lips while she slept. She has turned into something which I had never thought off as my dreams had confined to what I had seen in my home. I had only thought my life would be how maa and dad’s are, how they were a support to each other, how they completed one other’s wishes. Hence I had wished Geet would work in Rajnish Creations beside me taking our company to new heights nevertheless in these six months she has moulded herself in many ways be it helping maa in morning chores or working extensively in office or delight of being one everything has bought smile on this rosy lips of hers making my heart swell on gaining the most precious pearl in my life. If I have made her happy in a place where everyone is unknown to her then I have succeeded to make a small place in her heart but I would be blessed when she would come to me with her small small problems instead of cribbing to Babaji. I remove her hair which had fallen on her checks as I caress the smooth expanse more than a little. And I see the instant response as she curls into me that’s what I want from her as her babaji may not hear her every word or fulfil her wish but I would do hear her and fulfil them. I turned and held her in my grip but didn’t react to her attempts…She tried many ways like sneaking her fingers into my shirt or trying to mesmerize me with her charms & her pouts but this was the golden chance to make her speak my name out how could I leave that so easily. I made my heart hard… My brain constantly recited my mission in hand. It didn’t take me a second to reach her but I was a little hesitant whether to check her or not but then there was no one here and the tornado was infront of us. It would have not stopped for more than a few seconds and I could save her from this atleast, thinking so I slightly touched her hand to wake her up “Geet …. Geet…” Then what happened was something which I had never imagined as Geet not only turned but also looked very furiously and I felt water splashing on me. I wondered from where water came from even though it didn’t harm me, I was prepared to even deal with it through the flames of fire. My gaze went back to Geet who was now irritated by me while she stood up looking towards the storm. “Maan why did you come here…. you should have stood there like before & waited for this to end.” She marched towards me angrily. Now what did I do that she was reacting this way; I was as always away from everything. As if reading my mind she continued “I had successfully stopped it through my power of water, didn’t you feel water had stopped the march of the tornado. It took me so much of concentration to create the shield around the wind storm & you destroyed it within seconds. Who asked you to come near me see you broke my protection with your heat.” She marched towards me but I walked back not to get in contact with her as it would harm her as well harm me. She didn’t wait to hear me out but went back to stop Samir who was storming into us, fountain’s water which flowed was directed to the plants around the ground so it helped her to gather water from all directions and raised it the extent that it should actually swallow the whole of it. The water was crystal clear & calm if I didn’t see observe keenly the layer of water which was trying to elevate round it would not be evident. It appeared to be a difficult task now as the opponent knew the exact position & strategy that would be followed by Geet as rising water was deflected very easily by Samir. Although Geet was not able to cover the whole tornado her determination to stop it didn’t shatter a bit, she raised herself with the help of water to place herself in a better position to defeat the foe. But how much could you suppress air as Samir emerged out of the water wrap breaking the balance of Geet. She fell on the ground but this time she didn’t try to use the same plan as she disappeared into the water paths spread at the edge of the ground. Now that she is not here I can burn him off atleast that would help her if not me as I have lost hope of getting freedom from this fire. It is believed if one destroys the other person then he could live a normal life with everyone but there was a contrary belief also that he could rule the world with the new combined strength. I could not make anyone happy but she could atleast be pleased by this effort of mine. With the snap of fingers fire appeared like a balls in my palm but only small globes of fire wouldn’t be able to destroy the whole storm thus I amplified the flames emitting the fire through my taut chest which spread to strong biceps via muscular shoulders to meet the fire balls in my palm while the other side the same fire reached the foot hoisting me upwards to reach the mid level to tear it apart. I had completely got control of the storm ripping apart from the middle of it nevertheless the storm didn’t reduce it effect the more I extinguish it the more it generated from no where. Suddenly from middle Samir came into my view who looked annoyed with our interference in his destruction of this town. “How much ever you try Maan you will never be able to over power me” he said with a smirk on his face “I am supreme”. His words wouldn’t stop my attack on him, now my only plan was to prevent this devastation. I had to divert him if not destroy as Geet had left to make another plan however it looked like she is taking a lot time or maybe she is not coming out as I am near him. We both can’t be together ever but destiny could not stop itself posing us infront of each other. I, who am fire and she, who is water, want to fight together but how blend in one another without terminating the other. Single handed we are not able to fight him as he is not only invincible but also not allowing us to go beyond his wish as Samir is deflecting ever move we make be it through water or fire. And with ultimate force I target my flames towards him but Samir is more powerful as he deflected me pushing me into the water of the fountain. I was trying to come out of it but Samir had me under his clutches that’s when I heard a faint whisper “Maan…” I heard my name but where is she?